Most of us would agree that relations can be creepy, kooky, mysterious and spooky, but none are as altogether “ooky” as The Addams Family. The charmingly sinister clan has now taken up residence at the Crocker Theater, in a Cabrillo Stage musical comedy that opened last Thursday night. 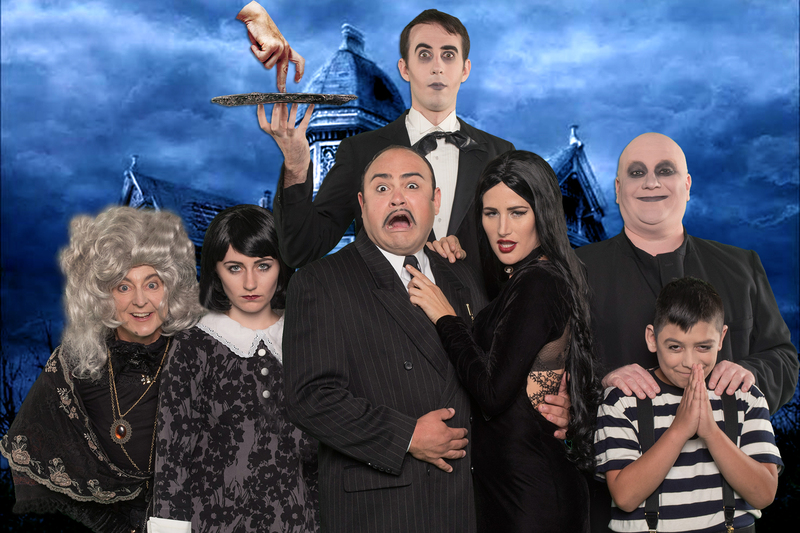 This gleefully ghoulish musical is the latest reawakening of The Addams Family. They originally appeared as cartoons created by comic artist Charles Addams and first featured in The New Yorker magazine in 1938. The popular characters inspired a 1960s television series and two movies in the early 1990s, followed by a New York Broadway theater premier in 2010. The Cabrillo Stage’s production of the Broadway musical gives audiences what they know and love best about this quirky family. Starting with the first strains of the overture and throughout the show, fans recognize Addams Family antics and revel in their absurdity. Led by music director Michael J. McGushi, a small but strong orchestra plays notes of the catchy television theme song, and the crowd eagerly responds – Buh-Da-Da-Dum (Snap Snap!!). When the stage lights up to reveal the assembled Addams group, there is enthusiastic applause. The playful musical arrangements, uninhibited atmosphere, and familiar characters engage the audience for the entire performance and are enhanced by a lively cast. Director Bobby Marchessault has gathered a committed group of actors and production artists to bring the show to life. 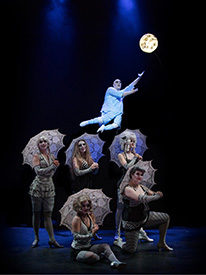 The eccentric Addams characters, Beineke Family and ghostly Addams Ancestors are played by local and Bay Area performers who collectively maintain a sense of zany theatricality throughout each scene. At the helm is actor Adam Saucedo, whose portrayal of the loveable family patriarch (Gomez Addams) wins us over with his energetic stage presence and passionate vocals. A blend of familiar traits and unexpected surprises keep the audience spellbound. Cousin Itt and Thing (the disembodied hand) make whimsical appearances; Uncle Fester (played by actor John G. Bridges) pines for the moon in an unforgettably hilarious way. The sets, puppetry, and special effects stand out as being remarkably creative. The microphones seemed awkwardly problematic on Thursday night, which distracted from some of the script and songs; although any tech issues will no doubt be resolved as the production continues. At times, the show’s comic relief comes across as slightly corny – the 4th wall is broken frequently, and some of the adult “wink wink” humor might be lost on younger audience members. However, the vaudeville experience and macabre themes are what make the Addams Family and this show delightfully unique and memorable. For all of the tongue-in-cheek jokes the musical also conveys sincere messages that will resonate with everyone: we’re all abnormal in some way, and we all feel the same mix of emotions. Most of us can easily relate to at least one of the characters’ predicaments. Their cheerfully morbid activities entertain as well as make us reconsider our aversion to anything unusual. 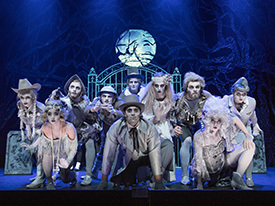 The Cabrillo Stage production of the Addams family proves that sometimes the darkest humor can ignite the most light-hearted, cathartic laughter. June 22nd through July 9th, 2017.